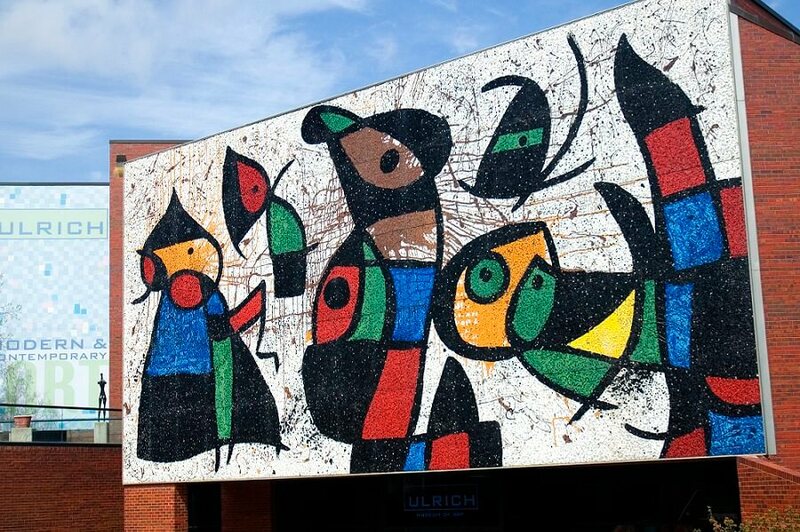 Personnage Oiseaux is one of Joan Miró's largest works in the United States and his only glass mosaic mural, 1972-1978. Miró created it for Wichita State University's Edwin A. Ulrich Museum of Art, Kansas. The mural is one of Miró's largest two-dimensional projects, undertaken when he was 79 and completed when he was 85 years of age. Fabrication of the mural was completed in 1977, but Miró did not consider it finished until the installation was complete. Personnages Oiseaux contains core ingredients of Miró's art. Colorful elements float freely across an expansive field. Perspective and modeling are absent, and the linear patterning suggests a sprightly calligraphy. According to the title, the abstracted figures are fantastical bird people. Miró regularly depicted birds, stars, and people to reflect his profound faith in humanity. The brilliant colors and fanciful creatures in the Ulrich mural embody the joyous celebration of life that is typical of his mature work. Although best known as a painter, Miró was also an enthusiastic experimenter. "I have always been interested in media other than paint," he wrote in 1960. The Ulrich commission gave him his first opportunity to design a major work that would be executed chiefly in glass. Copyright © 2009-Present www.Joan-Miro.org. All Rights Reserved.